We want to sing a new song this day – and yet we are surrounded by the tired refrains of conflict, of warfare, of retaliation and violence. How can we sing a new song – how can we sing your song, O God, as weapons are foisted, as war is declared, as bullets are numbered and drones are utilized to wreak havoc and destruction? Where do we find your peace amidst our own capacity to destroy? Help us learn to grieve, help us give voices to the lamentation and the despair as families are destroyed, as parents learn the horror of burying their own children and communities become barricades. Help us grieve for those in our own communities and for those miles, and oceans away. We do not know their names, we cannot comprehend their loss, and yet you, O God, know. You know their faces, their names, you knit them in their mothers’ wombs. We know you grieve as your children continue to seek and exact harm on one another. Help us find ways to build hope and wage peace. God, the temptation to revenge, retaliation, violence is great. We are surrounded by the ages old words of eye for an eye – and often we take an eye and a life. May we find in your new covenant the promise that only love, only peace, only grace can offer true reconciliation. Guide us to be agents of restoration and not retribution. Perhaps we look around at our world, perhaps we watch the images on television and sit, despairing. What can we do? Teach us to hope. Teach us to pray. Teach us to advocate. Teach us to channel our anger towards righteous causes of peace-building and Kingdom-seeking. 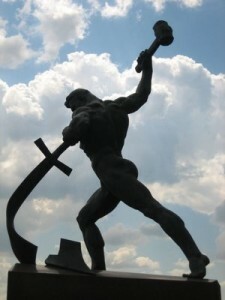 We read in scripture the promise of the day when we will beat our swords into plowshares. We read your promise that we will beat our spears into pruning hooks. What about the drones, O God? What about the chemical weapons? What about the unfathomable destruction we have wrought? How can we plant seeds of hope and peace in the midst of this? We cry out to you, O God – we cry out that we might grasp onto your promise of hope and peace. We sing in familiar tune, asking that you Be our Vision, Be our Wisdom and our True Word. More than ever, we pray that we might see with your eyes, and our words might be your words. Guide our hearts and our minds in your Wisdom – may we cultivate your Kingdom, your Peace that others might truly see you in all we do and say.